Today, Rep. Ileana Ros-Lehtinen (R-Fl), chair of the House Foreign Relations Committee, introduced the “UN Transparency, Accountability and Reform Act of 2011,” HR 2829. It combines an approach to US funding for the UN which supports American goals and interests with provisions that specifically target some of the UN’s bullying tactics against Israel, which — it should be remembered — is allegedly an ally of the US. The bill says that the US will not fund UN activities that are in opposition to our interests by making our contributions for various programs voluntary rather than assessed. It states that the UN cannot use our money for purposes other than those for which it was intended. It withholds US contributions for any program that will upgrade the status of the Palestine observer mission, and ends US funding for the Hamas-friendly UNRWA refugee agency, the corrupt UN Human Rights Council, and the “Durban process.” It also includes a provision condemning the Goldstone report and calling for its revocation. A summary of the bill is here and a news report about the bill and reactions to it is here. It has 57 original co-sponsors. They are all Republicans. The Obama Administration opposes the bill because “This draft legislation is dated, tired, and frankly unresponsive to the positive role being played by the UN,” according to a spokesperson. The reference is to UN support of US actions in Afghanistan and Libya. But the Ros-Lehtinen bill wouldn’t prevent that kind of cooperation — indeed, it would make it more likely, since UN officials would have an interest in pleasing the US (and of course it depends on individual nations, not the UN bureaucracy). In actuality, the UN does not play a positive role in almost anything. Many of the useful specialized agencies like the International Telecommunications Union, the World Health Organization, etc. could be spun off, at which point the rest of it could profitably disappear. Short of that, by tying US funding to the actual activities of the units funded, Ros-Lehtinen’s bill could provide some accountability. Just as an example, how many Americans enjoy having their taxes support the UN’s Special Unit on Palestinian Rights (UNISPAL) and its annual International Day of Solidarity with the Palestinian People (every November 29, the anniversary of the partition resolution that they rejected)? Not too many, I’ll bet. What about the paying the salary of the Special Rapporteur on the Situation of Human Rights in the Occupied Territories, Richard Falk, who has publicly accused the US government of complicity in 9/11 and recently apologized to dogs for comparing them to Jews? There is no reason why this has to be a partisan issue. Aren’t there Democrats who resent having their money ($3.35 billion in 2010) spent by an unaccountable organization which as often as not opposes our national interests? Or Democrats who would like to see the UN reined in from attacking Israel? They are the personification of the atavistic Arab culture that does not abide an alien element in its midst. They are the bearers of the myth of Arab expulsion and the reality of refugeehood — although the Jews aren’t responsible for this, we are the ones who are paying for it. They are the popularizers of terrorism as a means to achieve political goals, the inspiration for Al Qaeda and others. They are a source of manpower for some of the world’s most vicious terrorist gangs. They are remarkably cruel, to their enemies and to each other. They consider cruelty ‘masculine’. They are the focus for the mental disorders of Jews like Larry Derfner (see here and here), who confuse their irrational guilt and suicidal impulses with morality. They are the primary tool of Arab, Muslim, European and world-wide antisemitism, which aims above all to end the Jewish state so that the Jewish people can be persecuted out of existence. Today the world’s leading Jew hater is Mahmoud Ahmadinejad, who — like Hitler — combines geopolitical goals with antisemitic ones. His objective is to remove US influence in the Middle East, get control of the region’s resources and establish a Shiite caliphate. He sees the existence of Israel as a major stumbling block for all of these enterprises, as well as an affront to Islam. Iran is developing nuclear weapons to strengthen its hand, but Ahmadinejad has said on several occasions that the Palestinian Arabs will be the weapon that will ultimately destroy Israel. “Recognizing the Palestinian state is not the last goal. It is only one step forward towards liberating the whole of Palestine,” Ahmadinejad told worshippers at Friday prayers on international Qods Day — an annual show of support for the Palestinian cause. “It is not enough for [the Palestinians] to have a weak, powerless state in a very small piece of Palestine. They should unite to establish a state but the ultimate goal is the liberation of the whole of Palestine,” he said. It should be obvious that the threat to peace emanates from Iran, not from the lack of a Palestinian state. The job of Israel’s government is to protect the Jewish state, and by extension the Jewish people. It is not to provide a solution for the Palestinian Arabs. The Oslo agreement of 1993 represented a disastrous deviation from its purpose, and has already resulted in thousands of Israeli (and Arab) victims. Oslo was negotiated in secret and foisted on the public — and I think on Yitzhak Rabin as well — by a cabal of politicians who understood that it would never be accepted by the great majority of Israelis, who (correctly, it turned out) didn’t trust the PLO. Whether or not it was originally intended to do so, the Oslo-initiated process has come to stand for the uprooting of Jews from the area east of the Green Line — the wholly arbitrary 1949 armistice line. The Palestine Mandate encouraged the ‘close settlement’ of Jews on the land — all of the land. And Jews lived in Judea, Samaria and eastern Jerusalem until they were forced out at gunpoint by Jordanian soldiers in 1948. Now the ‘process’ as interpreted by Barack Obama and Mahmoud Abbas calls for yet another expulsion. 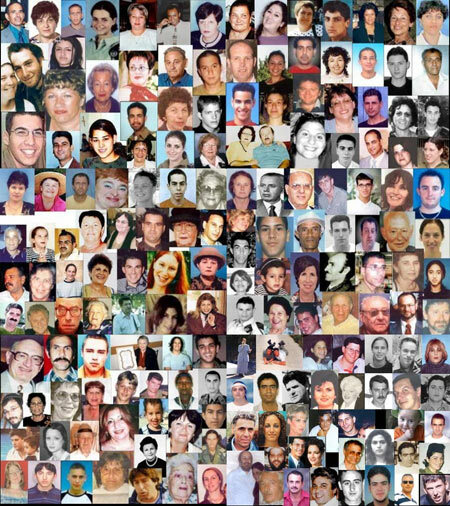 When 8,000 Jews were removed from the Gaza strip, it was a national catastrophe which still, 6 years later, hasn’t healed. When Avigdor Lieberman suggested that a peace treaty could include ‘land swaps’ in which Arab populated areas west of the line would become part of Palestine while Jewish settlements east of it would be joined to Israel, the Arabs screamed bloody murder — even though Lieberman was considering only a change of sovereignty in which nobody would have to leave their homes. That was a non-starter, but transfer of 650,000 Jews is considered reasonable! 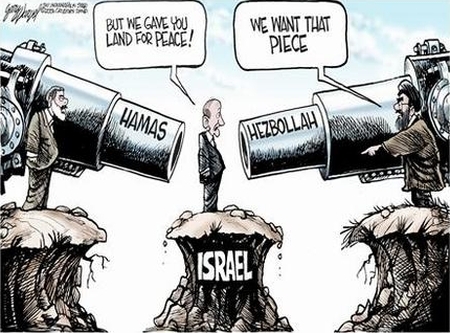 The ‘peace process’ never had a chance because the Arabs never wanted less than to replace Israel. It will officially end when the Palestinians go to the UN. The Palestinian Arabs are not the ‘other side’ in the conflict — they are primarily a tool of Israel’s more powerful enemies. Concessions to them are intended to weaken Israel strategically. European and Obama Administration efforts to force negotiations for a ‘two-state solution’ constitute hostile diplomacy. Israel should resist, not support them. They won’t go anywhere, and are simply a way to force concessions. The expulsion of Jews from Judea and Samaria would be a disaster. It would wreck Israeli society, even if the resources were available to house the refugees inside the Green Line, which they aren’t. It cannot be allowed to happen. Israel and the Arab states are in conflict. The conflict can be ended if Israel gives up the lands it occupied in 1967. This proposition was suspicious even in 1967, since the Jewish state — or even the Jews in pre-state Palestine — had never had peace until then, even without the territories. But the world in general — certainly the US and the European Union — at least pretends that it is true, and has worked hard to get Israel to divest itself of the land. So far Israel has evacuated the Sinai peninsula and the Gaza strip, surrendering them to complete Arab control. This represents by far the greater part of the lands conquered in 1967. The Oslo accords included a great concession by Israel: the PLO — which had been responsible for numerous murderous terrorist attacks against Israelis inside and outside of Israel — was allowed to return to the territories and constitute itself as a government, the Palestinian Authority. As a result of the Oslo accords, about 95% of the Arab population of Judea and Samaria now live in areas under Palestinian civil control. With regard to the Sinai, although the Egyptian regime refrained from overt conflict (in return for billions in US aid), it did not reign in incitement, nor did it take steps to improve relations with Israel. The ‘peace treaty’ was treated as an extended cease-fire, and now as the regime changes we are seeing a retreat from the idea of peace. With regard to Gaza, in effect a continuous state of war with Israel exists, and only fear of massive military intervention keeps a lid — loosely — on terrorism. With regard to Judea and Samaria, the PLO never accepted the ‘peace’ part of the LFP formula, insisting on receiving land without granting recognition (Mahmoud Abbas recently reiterated his refusal to accept a Jewish state as a neighbor to ‘Palestine’). The PLO does not accept the idea of ‘two states for two peoples’ and understands the ‘two-state solution’ as an Arab ‘Palestine’ free of Jews, and an Israel which — by virtue of ‘right of return’ — will have an Arab majority. 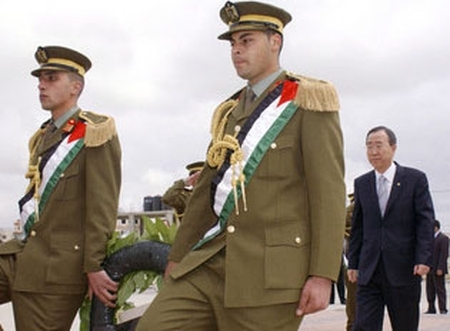 Although Israel made proposals for Arab sovereignty in 2000 and 2008, they were not accepted because they included a rejection of right of return and insistence on recognition. It should finally be clear that LFP is not a possible solution to the conflict, because the Arabs have never accepted that a Jewish state may exist in the Middle East. A senior source at the Foreign Ministry, which is busy trying to foil the Palestinian move at the UN, said that so far only five western countries have promised Israel they would vote against recognition of a Palestinian state — the U.S., Germany, Italy, the Netherlands and the Czech Republic. “Most western countries will not be willing to be in the hall and vote against a Palestinian state,” the senior Foreign Ministry source said. Of course, such a General Assembly resolution will not create a Palestinian state, and cannot be used to force Israel to do anything. Only the Security Council can apply sanctions or admit a state to the UN. However the GA resolution will be used as the basis for ‘lawfare’ against Israel, and is clearly the beginning of the process of implementing LFP, without the peace. And only the US stands against a Security Council resolution. May I be excused for thinking that Barack Obama is a weak reed to lean on? The official position of the Israeli government is that LFP can work, and that it’s possible to reach an accommodation by bilateral negotiation with the PLO that will result in a viable Palestinian state in the territories, and peace. It therefore opposes a UN resolution. It also points out, correctly, that such a resolution violates all of the agreements between Israel and the Arabs since 1967: UN Security Council resolution 242 (and others) which call for negotiations between the parties, the Oslo agreements, the Road Map, etc. Although I understand that it is important for the Israeli government to scrupulously maintain what it believes to be the most responsible position, I think it should officially recognize the failure of LFP. This is only a question of opening one’s eyes and seeing reality. Tali Fahima with al-Aqsa brigades leader Zakaria Zubeidi. At least she wasn't a hypocrite. Larry Derfner has issued an apology and removed the post I discussed yesterday from his site. I was one of his milder critics. I contented myself with refuting his argument. There were those who suggested that Derfner’s statement that Palestinian terrorism against Israel is justified — although he ‘qualified’ this by saying that he, personally, was opposed to it — constituted incitement to murder, a felony in Israel. Complaints to Israel’s Attorney General were prepared and possibly filed. I don’t know what the Attorney General will make of this. But Derfner is still wrong, for the same reasons. His statement that he believes terrorism to be justified while at the same time he doesn’t support it simply makes him a hypocrite. If he honestly thinks it’s justified, then he should have been out there on Route 12 with an AK-47 last Thursday. Other extreme left-wing Israelis, e.g., Tali Fahima, have made the choice to help Palestinian terrorists. She went to jail for it. Derfner is not prepared to go that far. But the degree to which he blames the victim in the conflict is pathological (that’s the only word that fits). Yesterday I described the false assumptions — about the nature of ‘the occupation’, Arab intentions and security issues — that stood behind Derfner’s argument. I won’t do that again. I do want to mention the really stunning falsehood that he repeats today: that Israel is hurting the Palestinians by denying them independence. Israel offered independence to the Palestinians several times, notably in 2000 and 2008. Negotiations intended to result in Palestinian independence have been going on fitfully since 1993. They have never borne fruit because the Palestinians have always insisted on conditions — like right of return — that are inconsistent with the continued existence of a Jewish state. 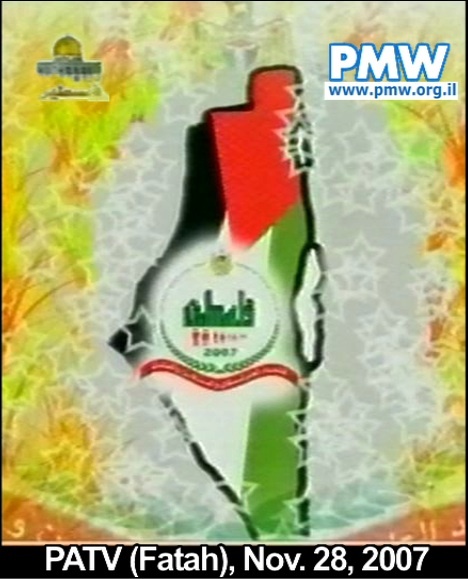 The Palestinians have never even been prepared to utter the words “Israel is the state of the Jewish people” or agree to the formulation of “two states for two peoples.” Official Palestinian Authority media continues to claim all of the area between the Jordan and the Mediterranean as ‘Palestine’. The PLO never removed the portions of its charter calling for the destruction of Israel, even after the US president (Bill Clinton) personally intervened. All during these negotiations, Palestinians have murdered Israelis. So I think the correct formulation is that Israel is hurting the Palestinians by refusing to roll over and die, which is driving them to kill . I’m sorry, there is no way that this can be Israel’s fault. Larry Derfner, a columnist for the Jerusalem Post, has published an article in his personal blog which argues, simply, that Palestinian terrorism against Israel is justified. Unlike many pro-terrorism writers who prefer to make their points by appeal to emotion, Derfner presents his immoral conclusion as the result of an apparently rational argument. As a logician, I see myself as a bullsh*t detective. I do my job by exposing unstated assumptions, as well as analyzing inferences for validity, finding hidden equivocations, etc. Sometimes just exposing the skeleton of the argument is enough to show its unsoundness. 1) ‘The occupation’ is unjust and is seriously harming the Palestinians. 2) Israel will not end the occupation on its own. 3) A nation “living under hostile rule” has a right of self-defense. 4) Palestinian terrorism is therefore justified. Right now, I am inviting Derfner to respond. Did I read you right, Larry? If not, please tell me which of the above propositions you do not accept. I’m not asking you to respond to my whole post — I know you would have plenty to say. I just want to know if I understand you correctly. Let’s take these propositions one at a time. 1) ‘The occupation’ is unjust and is seriously harming the Palestinians. To begin with, the concept of ‘the occupation’ is loaded with unstated assumptions. It includes the idea that the 1949 armistice line is a border, and to the east of it is a national entity that belongs to another people, which Israel is occupying. It assumes that Jewish settlements there are illegitimate. All of the above is a political construction which is by no means beyond question — and many of us question it. The 1949 armistice lines were accepted by no one as borders, and the right of Jews to settle in the area between the river and the sea granted by the Mandate hasn’t been renounced, although it was denied during the 1948-1967 period. Although Israel may make an agreement with the Palestinian Arabs to evacuate some of this area — which is at most ‘disputed’, not occupied — so that a Palestinian state free of Jews may be created in return for recognition and appropriate security guarantees, this hasn’t happened yet (and it isn’t Israel that is preventing it). So is the presence of Israeli settlements and IDF soldiers in this area ‘unjust’? If you accept that there is nothing illegitimate about Jews living there, and note the historical record of Arab terrorism and pogroms against Jews, from the Hevron massacre to the Fogel murders, then it’s hard to see the injustice of an IDF presence there, or the security fence, checkpoints, etc. Consider also the danger to Israelis west of the armistice line that emanates from the Arab population to the east, and it’s hard to call these things ‘unjust’. Does this presence ‘harm’ the Palestinians? Probably the opposite if you count things like infant mortality and standard of living — compare them to Arabs living in nearby Egypt, Jordan and Syria — but I will grant that they are harmed psychically by the frustration of their desire to have a state (we’ll leave aside the racist nature of the state that they want). Yes, the security measures are onerous, and even ‘harmful’ to some extent. But they are in direct proportion to terrorism, and the Palestinians can control them by controlling terrorism. It is also fundamentally dishonest of Derfner to use the word ‘occupation’ to mean ‘occupation of Judea, Samaria and eastern Jerusalem’, when the Palestinians use it to refer to any Jewish state between the Jordan and the Mediterranean. For one thing, Derfner implies that a withdrawal to the Green Line would satisfy the Arabs. Probably the major part of the Palestinians’ psychic pain comes from their narrative of the loss of pre-1967 Israel, not the Israeli presence in the territories. Does Derfner want us to end that ‘occupation’? 2) Israel will not end the occupation on its own. It is true that Israel will not evacuate Judea and Samaria unilaterally. The unstated assumption is that this is simply a ‘land grab’. Leaving aside the argument that it is racist for the Arabs to insist that Jews may not live there, there are good strategic reasons against a unilateral withdrawal without effective security guarantees. It’s not as if Arab intentions are somehow hidden — even the ‘moderate’ Fatah has made it clear that it considers all of ‘historical Palestine’ its property, and that violent ‘resistance to occupation’ is justified as a means to recover it. Even apart from the historical rights of the Jewish people, a unilateral withdrawal would be suicidal for the Jewish state. Could this change? Certainly, if the Palestinian authority were prepared to negotiate in good faith on terms and with guarantees that claims against Israel for territory or ‘right of return’ would end. Unless this happens, it is the fault of the Palestinians, not Israel, that there is no Palestinian state. 3) A nation “living under hostile rule” has a right of self-defense. This proposition is based on an understanding of ‘hostile rule’, that does not in any way fit the reality. The analogy is to the situation of Nazi-occupied Poland, in which a foreign power marched into another country, killed its citizens, and established a dictatorial rule for the purpose of exploitation. I realize that these are the exact terms that are used by Palestinians and their supporters, but with all due respect it is complete nonsense. Zionist settlers came to Ottoman Palestine, did not displace Arab residents, and indeed improved conditions there for all residents, Arab and Jew. They were met by racist and violent resistance to their presence culminating in a war (1948) that was described by Arab leaders as an attempt to kill or expel Jews from Arab land. Later, in 1967, the Arabs yet again fought a war intended to be the end of the Jews in the region, and again they were prevented from committing the genocide that their leaders called for. Keep in mind that the Arabs initiated the 1967 war and there was no national claimant to the territories more rightful than Israel. Who would it be? The Ottoman Empire? Britain? Jordan? No ‘Palestinian’ entity had ever existed. So Jewish control of the territories is hardly a ‘hostile rule’ in the same sense as the occupation of Poland, and does not confer a right of self-defense. The hostility, ironically, is primarily on the Arab side! 4) Palestinian terrorism is therefore justified. This proposition is morally abhorrent. The nature of Palestinian terrorism — vicious attacks against the noncombatant population, with special emphasis on children — is of a kind that is never justified, since it is aimed at third parties. The Palestinians choose these targets not only because they are vulnerable, but also because the particular psycho-social disorder that affects them makes cruelty necessary to ‘even the score’. This form of violence is sanctioned, applauded, encouraged and often ordered by the Palestinian leadership. Israeli actions against Palestinians are for most part defensive or retaliatory, where retaliation attempts to target perpetrators of terrorism with minimal collateral damage. This proposition would not follow from proposition 3) even if it did imply a right of self-defense in this case, which it doesn’t. Clearly there are ways to ‘resist occupation’ which don’t require firing anti-tank missiles at school buses. Derfner describes the present situation in an ahistorical and dishonest way. He blames Israel, when it should be clear that the Palestinians’ lack of a state is due to their refusal to give up the idea that they must possess all of historical Palestine. He makes a false analogy between the Israeli presence in the territories — which is based on historical rights and legitimate security considerations — and a hostile occupation, and claims that the right of self-defense that would apply in the latter case applies in the former as well. And finally, he makes a completely unsound leap from a right of self-defense — which doesn’t exist in this case anyway — to a justification of vicious terrorism against noncombatants. Update [26 Aug 1133 PDT]: Derfner has apologized for his post and taken it down. But he’s still wrong.